Jackson Academy’s headmaster has been named the 2016 recipient of the Southern Association of Independent Schools Distinguished Service Award. 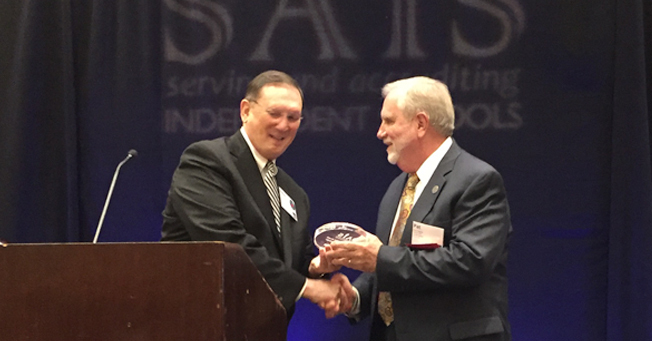 The honor was presented to Dr. Taylor Sunday at a banquet during the SAIS Conference. This award is given by the SAIS Board of Trustees to a head of school or senior administrator in recognition of a long and distinguished career in independent education, of which 25 years or more has been spent in service to one school, as well as service to SAIS. The Distinguished Service Award was inspired by the life and work of Dale Regan, who devoted 34 years of her life to the Episcopal School of Jacksonville, and who, posthumously, was the award’s first recipient in 2012. Dr. Taylor is the second educator from JA to hold this distinction. Peter Jernberg received the award in 2013. Dr. Taylor is the third Mississippian to hold the honor. Dr. Marvin Lishman from Magnolia Heights in Senatobia received the award in 2014. The four other award winners have come from Georgia, Florida, and North Carolina. At the banquet, Peter Jernberg was on hand to make comments about Pat Taylor’s years of service as an educator. Pat Taylor began his career in 1972 as a history teacher at St. Paul’s Episcopal School in Mobile and for the next 35 years served St. Paul’s as dean of students, principal, and assistant head of school. He also served as head of Houston Academy in Dothan, Ala. He completes his tenth year as headmaster of Jackson Academy in 2017, where he has led the academic team as it advanced into STEM education, an Apple K-12 one-to-one environment, the creation of a middle school, and personalized learning influenced by new brain research. He has served on the Southern Association of Colleges and Schools Alabama state committee, the Southern Association of Independent Schools accreditation committee, and is currently serving on the board of the Alabama Independent School Association.